Roland Barthes uses three terms in his essay The Death of the Author. The terms are Author, scriptor and text. To unravel The Death of the Author one must understand the relationship between these three elements. The ‘death of the Author’ to bring forth ‘the birth of the reader’ is not the death of artistic or authorial intent. It is the birth of the viewer’s relationship to art. No longer is the role of the viewer passive. Briefly, the Author is a modern-day construct born of French Rationalism and the Protestant Reformation. Prior to this, the responsibility of the narrative would have fallen to a shaman or mediator, “whose ‘performance’… may possibly be admired but never his ‘genius’.” Simply stated, a text is any object that can be “read,” whether an object, a piece of art, fashion, or a piece of literature. Barthes states “the Author is thought to nourish the book, which is to say that he exists before it, thinks, suffers, lives for it.” Vincent Van Gogh is an example of an Author. Van Gogh is an Author because when I see his work it is impossible to separate the myth of Van Gogh – his suffering, his madness, and his poverty – from his work. Barthes writes of the Author: “The explanation of a work is always sought in the man or woman who produced it.” Conversely, “The modern scriptor is born simultaneously with the text… For him…the hand, cut off from any voice, borne by a pure gesture of inscription (and not of expression), traces a field without origin—or which, at least, has no other origin than language itself, language which ceaselessly calls into question all origins.” Signs, words, origin and intertextuality are very important to Roland Barthes his concept of the scriptor. Barthes and Burroughs are both reflecting on the notion that everything – art, writing, music – is just a re-hash of something that already existed before. As Barthes states of the scriptor, “Did he wish to express himself, he ought at least to know that the inner ‘thing’ he thinks to ‘translate’ is itself only a ready-formed dictionary, its words only explainable through other words, and so on indefinitely.” The scriptor knows that the language, signs, and imagery that already exist are his tools. There are only so many letters in the alphabet, only so many words in our language and only so many arrangements to be made out of those letters and words. Barthes believes that the scriptor understands this and isn’t limited by it, but conversely, is invigorated and inspired by it. Artists like Tristan Tzara, Brion Gysin, William S. Burroughs, David Bowie, Brian Eno and Thom York have played with the notions by actually cutting up text and mixing music to find hidden meaning and prose (“The cut-up” and “fold-in” techniques). Ted Noten’s interactive piece/happening, Wanna Swap Your Ring? (1995), which I showed in my presentation, was designed to make each experience of the piece different for every participant. Each viewer brought a literal representation of their own history to Wanna Swap Your Ring? (a ring or circular object) to swap out for a Ted Noten Miss Piggy Ring and thus altered the piece. Wanna Swap Your Ring? was ongoing. Even if the same viewer came back to experience the piece again, they would have a different reading. “The reader is the space on which all the quotations that make up a writing are inscribed without any of them being lost.” It is because the reader sees all, the writing as well as the intertextuality of their own life experience, “a text’s unity lies not in its origin but in its destination.” As I addressed with Ted Noten’s Wanna Swap Your Ring?, with every reading of a text the reader’s experience and impression of a work will change. The scriptor understands this. Additionally Barthes states that, “Once the Author is removed, the claim to decipher a text becomes quite futile. To give a text an Author is to impose a limit on that text, to furnish it with a final signified, to close the writing.” The meaning of a work will never end, every time it is read, it will be different. When I viewed Jackson Pollock’s work as slides in my 20th Century Art course in college my experience was vastly different than seeing the work prior in Survey II, or later, in person at the Pompidou in Paris. Between those times I had taken more art history classes, traveled abroad, and seen the movie Pollock (another artist’s vision of the artist). I was also seeing the work in real life. The website of contemporary art jeweler Anya Kivarkis comes to mind and its startling lack of text, titles, and descriptions. The work stands alone. I do not pretend to know Kivarkis’s intent by leaving her website text-free, but it does allow for a “pure reading” of the work for me. I am an artist who works with metal, who has read about Kivarkis prior, and has read about art jewelry in general. My reading of her website will be very different than someone else who does not share my life. With or without text it would still be this way, but without text it is more so. Maybe this is her intent? I do not know and I chose not to assign an Author and ‘close this text,’ as Barthes would say. I rather enjoy thinking about it. When Roland Barthes concludes The Death of the Author with the seemingly melancholy statement “the birth of the reader, must be at the cost of the death of the Author,” he isn’t saying that there is no longer a place for meaning or intent in artwork, he is saying that it is the scriptor’s responsibility to understand this “new way” of reading text. I do not think that Barthes is negating the legitimacy of expression or the Author – but he is giving power to the reader. The scriptor is better equipped to handle this because the scriptor understands the power of the reader. 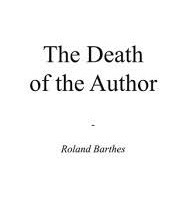 Roland Barthes’ The Death of the Author really resonated with me as an artist; I am a maker but I am also spending equal time reading, thinking and writing about why I make. Bruce Metcalf wrote that “thoughtless work is mindless work.” I have been struggling with conveying this aspect of my process. Over the past few months I am wondering if sharing that part of my process with my audience even matters. Words and text seem both simultaneously sterile because we as a people are desensitized through over-saturation of information, yet loaded with subjective/cultural meaning. I know what my work means to me (today), but does it matter if you do, or if everyone does? Barthes, Roland. “The Death of the Author.” In Image, music, text. 1977. Goring, Elizabeth. “Jewelry and Communication: Breaking the Code.” Metalsmith 26, no. 4 (2006): 6-9. Kivarkis, Anya. “Work.” Anya Kivarkis. http://anyakivarkis.com/project/work/ (accessed April 28, 2014).